This website is dedicated to featuring all the articles to date penned by Shaykh Dr. Abul Hasan Hussain Ahmed (hafidhahullah), in the fields of ‘Aqida, Hadith, Fiqh and many other sciences. Shaykh Dr. Abul Hasan Hussain Ahmed is a resident of the UK who initially studied the Islamic Sciences for more than 5 years under the late Muhaddith and Hanafi Faqih, Shaykh Abdal Haleem (d. 2004). The Hanafi faqih and aqida specialist, Shaykh Wahbi ibn Sulayman Ghawiji al-Albani (died on February 21st 2013 aged 90), The Aqida specialist, Shaykh Adib Kallas (d.2009 aged 89), The Hanafi faqih and Qari, Shaykh Abdar Razzaq al-Halabi (d. 2012 aged 87), The Mufti of Halab, Dr Ibrahim al-Salkini (died in 2011), Shaykh Ahmed al-Habbal (d. 2009 aged over 100) and Shaykh Muhammad Darwish al-Khatib (d. 2011 aged over 100). Amongst his living Shuyukh are the Muhaddith of Syria, Dr. Nurud-Din Itr and Shaykh Muhammad Fu’ad Taha (aged over 100). The late Shafi’ Muhaddith, Shaykh Hussain Usayran (d. 2005 aged 94) of Beirut and the latters pupil, the Muhaddith, Dr Yusuf al-Mar’ashali. Shaykh Tihami ibn Muhammad al-Wazzani (d. 2009, aged 138 Hijri years), the late female Muhadditha, Sharifa Nafisa al-Kattaniyya (d. 2006), Shaykh Hasan al-Isma’ili (d. 1430 AH, aged 125), Shaykh Abdar Rahman al-Kattani who is the son of the Hafiz of his age, Abdal Hayy al-Kattani. Shaykh Hasan al-Ghumari and Dr Muhammad Hamza al-Kattani. Shaykh Malik ibn Umar ibn Hamdan al-Mahrasi, Shaykh Muhammad Nadir al-Arkani al-Makki (died aged over 130 in 2011), the late Burmese Musnid in Hadith, Shaykh Salih al-Arkani, the foremost Muhaddith of Madina, Muhammad Awwama. 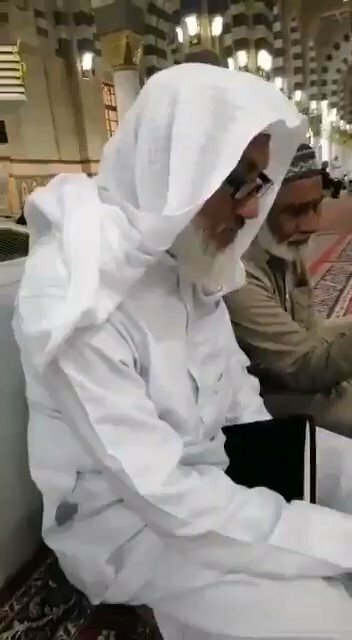 Shaykh Dr. Ali al-Abbasi – Imam of Masjid al-Aqsa who leads Fajr & Isha Salah. Shaykh Abdar Rahman al-Hibshi (b. 1314 AH and still alive in 1434 AH, aged around 120) and al-Qadi Mustafa Bounmi (b. 1338 AH). Shaykh Nasir Ahmed (b. 1335 AH), Sayyid Salman al-Hussaini and the late Shaykh Ahmed Ali al-Surati who lived in Leicester and died in 2011 aged around 95. The late Shaykh and his paternal grandfathers younger brother, Muhammad Asaddar Ali (d. 2005 aged over 100), Shaykh Abdus Subhan al-Sunamgonji and Shaykh Ahmed Shafi’i. The shortest chain he possesses back to al-Hafiz ibn Hajar al-Asqalani (d. 852 AH) is from a stupendously short 6 links (via Ijaza li ahl al-Asr) only, from the late Hanafi Shaykh, Kamil ibn Yasin al-Kalabadhi. On the secular front he has qualified with a First Class Honours degree in Applied Chemistry attaining first position in his class with a subsequent Doctorate in the same field. He has also worked as a Researcher in the Chemical industry. In his spare time he compiles various Islamic articles for mainly internet distribution. Of the largest two works he has written are one in defence of 20 rak’ats of Taraweeh exceeding 300 pages and his latest piece is regarding the authenticity of a narration from Malik al-Dar describing a certain event that occurred during a drought in the time of the second caliph, Umar ibn al Khattab (ra) in more than 400 pages. Currently, he is working on writing a bulky work on the matter of where the hands should be placed in Salah with an analysis of practically all known narrations on this specific matter. This work will by Allah’s decree also show some rare narrations that have not been quoted by most of the Muhaddithin of the past and have been discovered by means of painstakingly collecting rare Arabic manuscripts from some Muslim lands. In this regard, he is also a collector of Arabic manuscripts and to date holds more than 100,000 from all over the world. Assalam alaikum Dr Abul Hasan H. sb. Today i m pleased to read an article on Taqlid collected by you with some very useful footnotes. May Allah increase you in knowledge. Ameen. Secondly i m also impressed when i went through your biography. I m from Mumbai suburbs India and associated with a college imparting teaching serveces, say a professorship. May Allah reward you immensely for your efforts. Very well written and very scholarly articles. Full of knowledge and wisdom. May Allah accept it from you. Beloved Shaykh hats off to your master piece articles. I visit and read posts on your website with great enthusiasm. May Allah Ta’aala bless you with best in both worlds. I also wanted to enquire about the research that you were putting ion about Rafa’ yadain. Has that been completed? When will it made public.